Sometimes traps or fences just don't cut it when it comes to protecting domestic plants or animals. For those times, a lethal control method may be necessary. 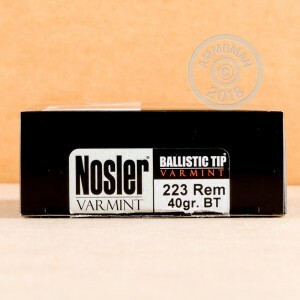 For many varmints such as coyotes or nutria, a .223 Remington rifle loaded with this accurate polymer-tipped hollow point ammo from Nosler is the perfect countermeasure. 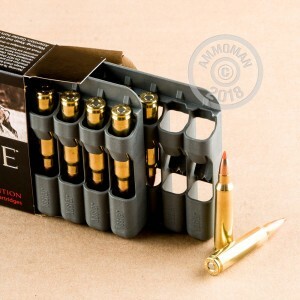 These cartridges fire a fast-moving (3,625 fps muzzle velocity) 40 grain Ballistic Tip designed to produce rapid expansion, relatively low penetration, and deadly terminal ballistics against small game. Each Ballistic Tip bullet is designed to fragment in its entirety, sending pieces of both the jacket and the core into your target for a quick ethical kill. This ammunition is best employed in a rifle with a 1-12" twist barrel. 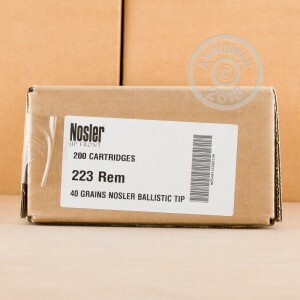 Like other Nosler ammo, it uses non-corrosive Boxer primers and brass cases. The .223 Remington/5.56 NATO cartridge found in both AR-15s and other semi-automatic and bolt-action rifles is a great round for animals below deer size because of its high velocity and ability to fragment rapidly.